Built in the grand tradition of the early hunting and fishing lodges, from local fir trees and river rock, our lodge exudes a rich ambiance that compliments the area’s outstanding rivers and streams. With capacity for eighteen guests, Great Waters Inn can accommodate corporate gatherings as well as smaller groups of visiting anglers. Mark is an honest, engaging, hard working guy who knows the Big Hole and other area rivers as well as anybody. He employs a guy named Brent Taylor and Brent's wife, Jen. Mark, Brent and Jen are the folks you want to fish with in SW Montana. And the lodge location and food are the best. 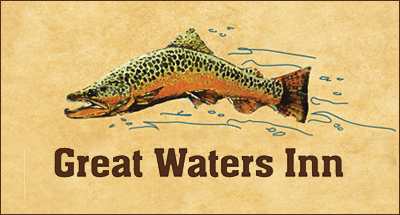 After many trips to the Beaverhead, Big Hole and other area locations, I've found the best value fishing is with the folks at Great Waters. Our host Mark Lane knew what three ladies coming to Melrose wanted, and made every effort to accommodate our needs. While appreciating what the area provides for fly fishing , we opted to book a field trip for bird watching. Our guide Terry was knowledgeable, amusing and gave us a trip to remember. If you want to find a retreat to enjoy with a few of your friends and enjoy the great outdoors this is the place to go. The food is good, the wine is great, and the people are wonderful. I've been to Great Waters Inn five times now, and I've always had a great time. And I intend to go back. I just returned from a trip. As always, Mark and his associates' guiding services are top notch, the food is excellent, and the environment is beautiful. The local wildlife is amazing; aside from catching many fish (I lost count), I saw beautiful birds and a moose. And most importantly, during each visit, I get to spend quality time with my grandfather, cousins and siblings.